WOW Joyce, these are amazing. I just love them. I love how you cut out the houses on the first card. Just fabulous. 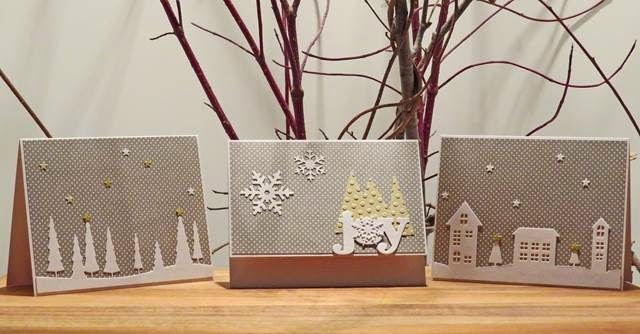 Love the way you used the houses here, Joyce, the make a great trio of cards! A trio of fabulous cards. Love, love, love those houses. These are wonderful! I love the adorable, bright DP you've chosen and the 3 ways you've used it! So glad you joined us at Muse this week! Wow, aren't you clever! 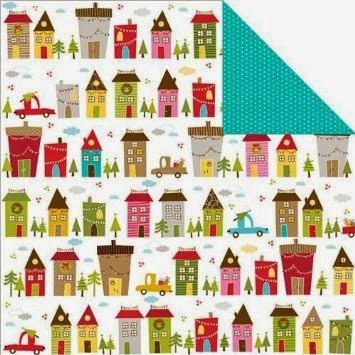 What a fantastic paper to use--love all your designs with the little houses! love love love your little house cards! Wow...these are just too darn cute!!! I have about a dozen pieces of this paper just to hoard, so now that you have provided me with such incredible inspiration, I may just pull a piece of it out to cut...You were so brave! What a great way to use these charming papers, Joyce! I love that each card is so unique, too...beautiful card set! Wonderful use of patterned paper! Love you cards, really cute holiday cards! As a fellow hoarder, you shouldn't have hesitated at all, these are darling. These cards make me smile! Gorgeous cards! I love them! Bright and cheerful! Fabulous cards - glad you stopped hoarding that paper! Love these bright colored beauties!!! Your cards are beautiful - very clever use of the paper. I can see why you love this paper, Joyce. It made such darling cards. Fussy cutting is not something I enjoy but you really made it work for you. I can see why you like this paper - so bright and cheerful. Love all the cards, but I think my favourite is the one with the houses on the stitched hills. Great work. Joyce I can seriously say that these may be my current favourite cards of yours!! I have that hoarded paper and cut into it last year, now I am hoping I have a second peice. I am so over the moon about these! Oh my goodness, Joyce! I so love your set of cards, especially the one you said is your favorite! I wanted to do this challenge, but no time. You've inspired me to get out a piece of my hoarded paper & make a set! These are brilliant! Love the way you used the paper here and I can see why you were hoarding it - it's so fun!